The sheer number of cat toys on the market can be overwhelming, especially to newer cat owners! Petco, PetSmart & every other pet store have aisles and aisles of toys, who knew we’d have so many people dedicated to designing stuff to entertain the pets we have to love & entertain us?!?! I don’t know how many times I’ve read that a toy is irresistible or that it is simply the best toy in the world, hands down. These claims are useless and you really shouldn’t bother reading much into them. When I got my first cat a very large percentage of the toys that came into my house went to the donation bin at my local shelter because my cats simply had zero interest in playing with them. Ever. Instead of trusting a box be sure to consult your fellow cat owners on their experience (product reviews are key!) 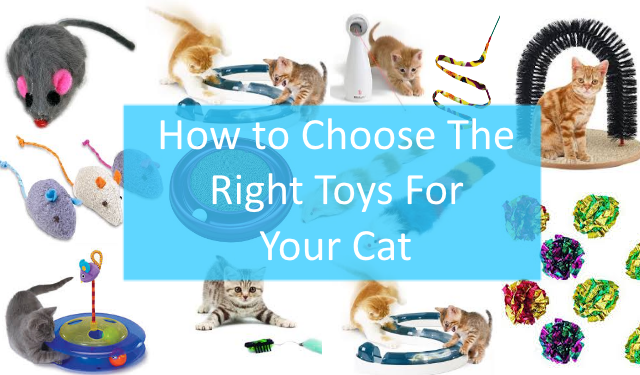 and then use any experience you have with your particular cat(s) and sprinkle in some general tips to make a decision on how to choose the right toys for your cat. You’ll likely need a variety of different toys depending on how you want to play with your cat. My cats love the solo toys, particularly at 2 or 3 in the morning when I’m trying to get some sleep. You should not rely strictly on automated toys because you’ll miss too good of a bonding opportunity with your cat by offloading all the responsibility to a machine. Another potential problem with fully automated toys is that they can pose a danger to your cat given the design, some of the string throwing toys can have the string easily snapped off and swallowed. My personal favorites are interactive toys where both you and your cat participate. The most classic example here is the wand toy because your cat knows you are playing with them and they are getting all the benefits of the play session. There are of course a host of health benefits when your cat plays with a run of the mill stuff mouse or a plastic ball, most of these are physical. There are plenty of toys out there that will also exercise the mental faculties of your feline friend. These are usually geared toward feeding puzzles or treat dispensing toys. While mental challenge to get to treats is a great way to encourage exercise always be sure that you’re not counter balancing the exercise with an excessive number of treats or too much dry food! A puzzle feeder is a great idea for your cat if you already feed them standard dry kibble! Be sure to take into account the size of the toy. In my experience you’ll want something that is the size of prey your cat might have actually hunted in the wild. While there are those rare cats that are happy to pounce on something the size of a Roomba, more often than not you’ll want to aim for something closer to the size of a mouse or a small bird. As a general rule of thumb, if your cat can’t easily fit the toy in his or her mouth to carry it around the house then you should likely choose something a little bit smaller. It is no surprise that you’ll want to choose a toy that can stand up to a beating. Cats are known to play with their food, basically to bat it around quite a bit. They’ll also happily claw it and bite it once they’ve pounced on top of it. This means you need a toy that won’t simply fall apart at the first sign of a cat claw. The bulk of toys that are made strictly of things like lightweight cardboard will fall apart quickly so be sure you do your research when considering a new toy. Not for you, for your cat. Cats are known to eat many types of toys if left to their own devices. This is particularly true of toys that have small parts or that have a lot of strings or feathers hanging off of them. Be extra careful about toys that look like pieces may fall off of them and ensure you supervise play sessions. You should probably keep a close eye on any toy you give your cats and you may want to proactively remove things like the googly eyes and the smaller easily pulled off tails. You can simply pull them off. This makes sure your cat won’t swallow them. 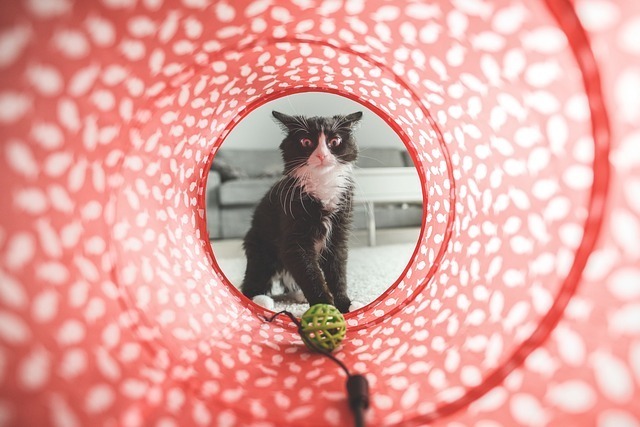 If you have a house that gets a lot of natural light, not only will your cats find wonderful places to sleep, but they’ll also love toys that reflect that sunlight. 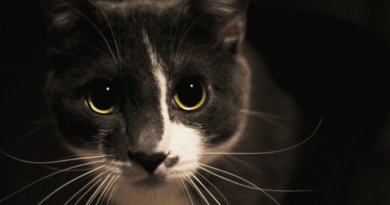 Cats have eyes that are designed to see moving objects extremely well so a reflective or light up ball does a wonderful job at catching and keeping their attention. Many cat toys out there have small sound boxes built into them so when a cat bats it or squeezes it a bird chirp or something of the sort comes out. This is a great way to encourage your cat to play! My two cats absolutely love a small door hanging bird we have that chirps every time it bounces. It is worth noting though that you should also keep an extra close eye on these toys. These toys have batteries and the sound emitter is usually a small plastic box that could potentially be ingested if the toy pops open. Cat owners know that texture is very important to cats. Cats are incredibly sensitive in pretty much every aspect and they’ll let you know it as well. Some of the more common areas you’ll see this exhibited are in cat litter and in wet cat food, but if factors into toys as well! Your cat may prefer a soft toy that’s easy to bite or he may like a smoother toy that’s easy to bat around like one of those rolling plastic balls. My cats absolutely love Gear Ties for one reason or another! You can choose a feather toy, a burlap sack, a fuzzy one, one with crinkly paper inside and the list goes on! There also the always classic cardboard box. There is no shortage when it comes to cat toys and their variations, you might just have to do some testing to figure out which ones your cat loves. Can You Game the System With Catnip? The chemical compound in the plant that cats have a reaction to is called nepetalactone and it can be found in both the leaves and stems of the plant. Research indicates that only 50% of cats are actually impacted by catnip and that it is inherited genetically. It is also worth noting that kittens are not impacted by catnip so you’ll have to wait until your kitty is at least a couple of months old to determine if it’ll have any impact. If your cat is affected by catnip you should definitely add a few catnip-stuffed toys into your regular play routine or aim to grab some catnip spray that can be sprayed onto any toys that don’t have an inner compartment. Just like any other substance though if your cat has catnip too often they’ll become desensitized to it and you’ll need to stop using it for a few weeks or months for the typical reaction to return. PetMD recommends only using catnip every other week or so to ensure it’ll work when you want it to have an effect. It is also worth noting that catnip loses potency as it ages. You can store extra catnip or catnip toys inside a Tupperware container and stick it in the freezer for extended freshness. Which Toys Are the Best Toys? As you can see there are a bunch of different items that factor into selecting the best toys for your cat. The key things I would keep in mind are to ensure you try a variety of toys and participate in the play sessions as often as you can. If you don’t have time to directly interact with your cat then I’d highly recommend you at least supervise play sessions with any toys that might have small parts or strings that could end up being swallowed accidentally.. 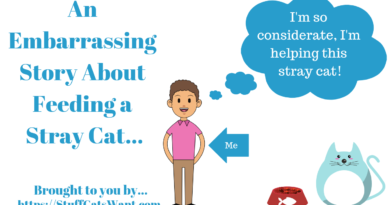 If you have any thoughts on other considerations while selecting a cat toy then please leave a comment below or send me an email at Craig@StuffCatsWant.com so I can update this article or respond in kind. This is an interesting site. My cat is 15 or maybe 16yrs old now. His Highness thinks he is too good to play anymore. He used to love to chase birds. Now he loves to sit in the couch behind my head and talk to me. He is very vocal, about everything. He wants 1 level tablespoon of soft food and 1 tablespoons of kibble, not more though, he will turn his nose up and walk away. If there happens to be less then he is equally unhappy and more vocal about it. If I haven’t noticed that he used his litter box, he tells me, and he won’t use it again until it is clean. (Cant say I blame him on that one..) When it’s time for his brushing, he tells me. When he wants to lay on the bed, he calls me to lift him up. Funny though, he has no problem jumping to the top of the couch. Silly cat! Hahahaha, your cat sounds amazingly funny, while I can see that being a little bit frustrating from time to time as well! I’d say give the classic laser pointer or wand toy a shot if you’re going to try anything, they seem to be the most consistently liked across all cats. 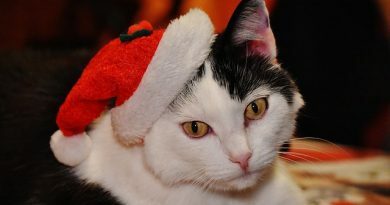 Awesome post on toys for cats! I love playing with my cat every time I get the chance. Wand toys are my cats favorite. I’ve found wands and laser pointers are the most common toys that pretty much every cat can relate to and enjoy. There aren’t many cats out there that will completely ignore both of them!